"White Winter Dusk" is a lovely, soothing track almost sounding like a lullaby with its opening. Wayne is certainly Mr. Consistent when it comes to creating memorable melodies, and this track offers proof if ever it were needed that he has a true gift in this department. "Waves Across the Wheat Field" is one of my favourite cuts on the entire CD. It has an instantly appealing melody, capturing the wheat field on a blowy day. 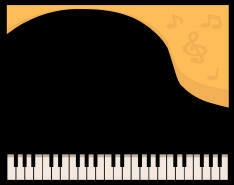 The rolling piano notes represent the wind-swept wheat. "Simply" lives up to its name- an uncluttered piece, which holds great appeal. "Soaring to Earth" is a livelier track featuring a memorable melody. Could this be a bird of prey gracefully making its way ever downwards? "Thor in the Pastures" is a darker, more unsettling number certainly at first, but evolves into a delightful track. Probably my favourite piece on the entire CD is Track 7, "May Morning". A simple enough melody, but one that is exceptionally beautiful. One can picture the fields of blue-bells in the woods early on in the morning. This type of track- with its minimalist opening- is what Wayne does best, and there are very few pianists out there who can compete with this composer's ear for a melody time and time again. A close-second, "The Pathway Home" also hits the spot. This piece is more reflective. The journey home is a time for contemplation, and memories both good and bad resurface. I just love the brooding melody, and this is one of those pieces one finds oneself whistling throughout the day. "Reaching for the Shoreline" has the trademark Gratz-sound. I know Wayne has a passion for the water- perhaps he is missing his fishing-fix during his journey. Another appealing melody, another winning track. I'm intrigued by the title of Track 10- "Tree Castles". A delightful melody ensues, and this is one of those slow-tempo but exceptionally beautiful tracks. Perhaps Wayne himself will enlighten us. Track 11, "Place of Inspiration" is another piece which holds much appeal, through its gently evolving and most graceful melody. As the title would suggest, this mystery location clearly got his creative juices flowing, and the end-result is another pleasing composition. I am very touched by the twelfth track, "Natalie's Story", and it is obvious that the composer was greatly moved by the tragic circumstances surrounding the death of this beautiful three year old. Wayne delivers a perfect balance between reflecting on such a sad loss and celebrating a short but never-to-be-forgotten life. The next track is entitled, "Kyra's Dance"- a reference to Wayne's partner. Clearly, she has been inspirational to him and this joyous track perhaps celebrates their time together. The penultimate track is entitled, "Distant Train". The slow rhythm of the train appears at the start and, to this reviewer's ears, it remains far-away throughout! This track is quite the opposite of Philip Aaberg's "Westbound" track on his Live from Montana CD which captures the full intensity of a train. Wayne's express is having a gentler ride. This breathtakingly good album closes with a short track entitled, "A Breath of Autumn". We have almost come full circle through the seasons. Parts of summer still linger on, but there is also a hint of what is to come. I found this to be quite a haunting track, almost warning of the dangers ahead. This is a superb CD, and I am most impressed by the extremely high-level of consistency maintained throughout the CD. There are no fillers here; each track delivers at the highest standard. Visit www.waynegratz.com to order the CD direct from Wayne's web-site, or order from www.cdbaby.com. An exceptionally good CD, and one to which I give my highest recommendation. Well done, Wayne!